The UR Biomedical Engineering department was well represented at this year's Biomedical Engineering Society Annual Meeting in Hartford, Connecticut. In attendance were 5 faculty members, including Dr. Richard Waugh (BME Department Chair and BMES President), 5 graduate students, 2 staff members, and 24 undergraduate students, who presented posters and spoke about their research. 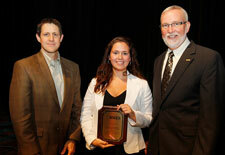 The event was highlighted with the UR BME Student Chapter being awarded the Student Chapter Mentoring Program Award. This award recognized the UR BME mentoring program, established in 2010 by Ben Freedman BME '11. The program pairs upperclassmen and graduate students with freshmen and sophomores and encourages communication between class years and the passing of knowledge about classes, workloads and in the future, networking opportunities.